Join Captain Fred Rodolf on board the Lu-Lu Belle, as he takes you to the mighty Columbia Glacier, the second-largest tidewater glacier in North America and largest in Prince William Sound. Experience some of the most spectacular calving events in the world, from the decks on the Lu-Lu Belle. See for yourself as the ice falls into the sea causing thunderous explosions resulting in massive plumes of spray and wave activity. We will stay at the glacier for at least an hour to make sure you have a chance to photograph and/or record some of those amazing events. 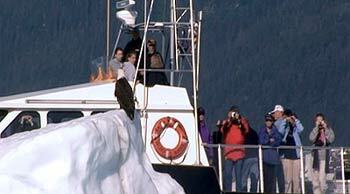 Closer to the eagles (pictured at left), whales, glaciers, and other wildlife in and around Prince William Sound. Prince William Sound is one of the most spectacular and unspoiled wildernesses in the world. Majestic blue glaciers explode into its calm fjords. Humpback, killer, Minke, and Gray whales rise from dark waters, surface and spray with clouds of breath into the clear Alaskan air. Seals, Stellar sea lions, and otters sun themselves on frozen rafts of ice. Dall porpoise slip in and out of the wake of the Lu-Lu Belle. Prince William Sound is a sanctuary to endless species of birds, including bald eagles. Many species of marine and other wildlife enjoy this timeless environment, wonderful and uninterrupted. Not many places in the world can claim such natural beauty. You have a chance to experience this last frontier first-hand aboard the Lu-Lu Belle. As you cruise through the many fjords of the Chugach National Forest, you'll be able to watch the fishermen at work, harvesting a bounty of salmon from the cold Alaskan waters. The Lu-Lu Belle will take you to visit the Port of Valdez, alive with one of the most prosperous industries in the world, the terminus of the TransAlaska Oil Pipe Line. You'll be able to capture a tanker's eye view of the loading piers, where millions of barrels of oil leave Valdez each year for the refineries of the Lower 48. The cruise can vary in length anywhere from 7 to ? hours. The iceberg conditions at the Columbia Glacier are always changing, and the glacier face has moved approximately 12 miles from where it was in 1979 when we first started doing our cruises. There is no way to predict how long it will take to get to the glacier face; but if any boat can make it to the face, it will be the Lu-Lu Belle. Please don't watch your clock, because the crew does not. The Lu-Lu Belle is in a class by herself, with her plush atmosphere of teak, mahogany and oriental rugs. Captain Fred Rodolf hosts each and every one of the cruises, sharing with you information it has taken him years to acquire. The crew prepares fresh baked goods in the galley during each cruise. A snack bar is also available throughout the day. You will enjoy friendliness and gracious hospitality aboard this beautiful yacht. It's no wonder that people refer to the "Lu-Lu Belle" as the "Limousine of Prince William Sound". Make reservations for a cruise aboard the Lu-Lu Belle online or call 1-800-411-0090.